The challenge set forth was to make something in a week that "you" the artist would wear for a red carpet event. I've been wanting to do a series in this style for a long time and it just needed a "push" to come out. The mounting is quite high--one full inch off the band of the ring. Thanks ladies! Its also very comfortable to wear. Love this ring. So me. Creative. How can I find out how to purchase this ring. 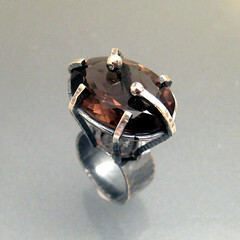 I sold this ring, but could make a similar ring. My website is www.sarawestermark.etsy.com. You can request a custom order.